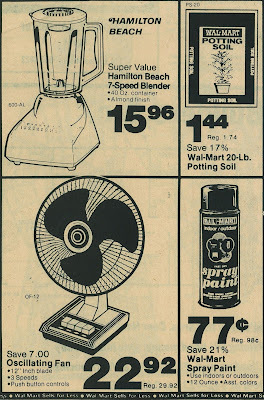 You know you're a redneck if your fondest memories growing up took place in a Walmart discount store. I'm proud to say that many of mine did! 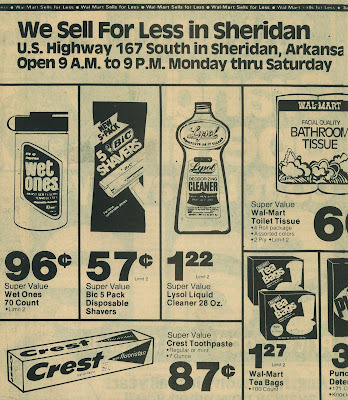 Right after the Sheridan Wal-Mart (pronounced "WalmartS") opened in 1980, on a rare and very special occasion we would take a trip way down south of town where Cliff Peck Chevrolet was before it burned. 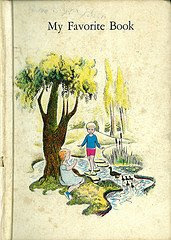 Don't remember Cliff Peck? How 'bout that circus outfit that came to town about as often as Haley's Comet... remember that? All happened in the same spot. Cliff Peck Chevy... rag tag circus event... new Walmart. And now, of course, the new Walmart Supercenter. Joe Dan Reed's grandma worked there, so I thought she owned the store & could get Joe Dan anything he wanted. Lucky. He did get the first EVER digital watch that would play "Dixie" from Walmart. I don't think I've ever wanted something more in my life than a watch that played "Dixie". My dad finally bought one off a guy at work... played "Dixie" AND "Stars and Stripes Forever". Eat your heart out Joe Dan! We bought our first microwave at the Sheridan Walmarts. It weighed 300 pounds. At this Walmart, I resisted the urge to buy one of those fake "Panama Jack" shirts - so wanting to fit in, but knowing that wearing anything off the Walmart clothing rack was not the way to do it. For obvious reasons, I not only resisted - but refused to buy one of John Anderson's "Swingin'" T-shirts from this store... even if Charlotte Johnson was "really lookin' good." 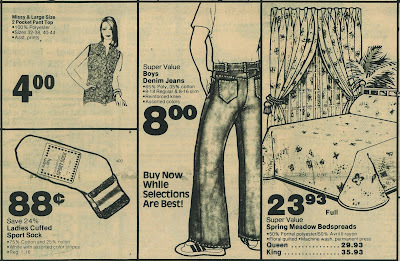 This Walmart used to sell Wrangler - back before they were cowboy cool. 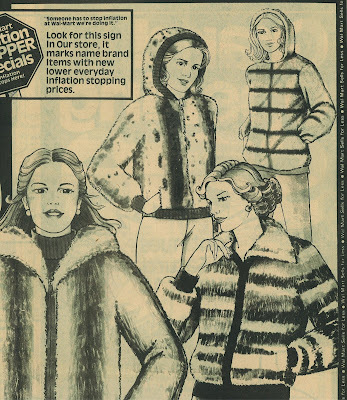 I bought many of these at Walmart. As I alluded to earlier, I got my very first job at this Walmart as a stockman. I eventually worked in the Electronics department selling these new-fangled digital audio recordings called, "Compact Discs" to many of you. Well - not many of you... only those who could shell out $600 for the CD player. I later would work my way up through the management training program beginning in this store. 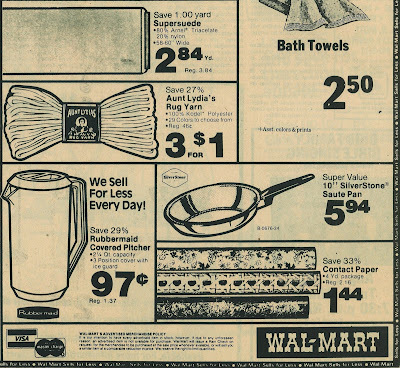 And, the most memorable event I have from the Sheridan Walmart: I met my wife in this store. Now THAT, my friends, is RED - NECK! And those are my memories from the Sheridan Walmarts. 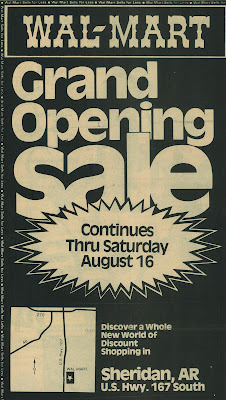 Now, here are images from their Grand Opening Ad from a 1980 Sheridan Headlight. We never could afford Prang watercolors. Now I see why... they were high!. The boys' football jersey above can now be bought on Ebay under the "Vintage Clothing" category for about twenty bucks. Hole N' Sole Sandal. Nice. 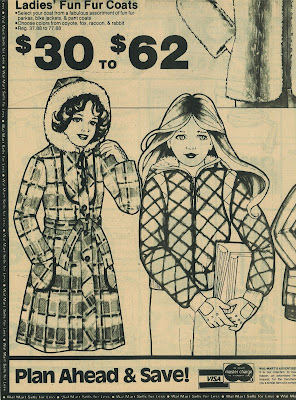 I'd bet if I dug around long enough, I'd find some old 4th & 5th grade photos of some of you girls sporting coats like these! 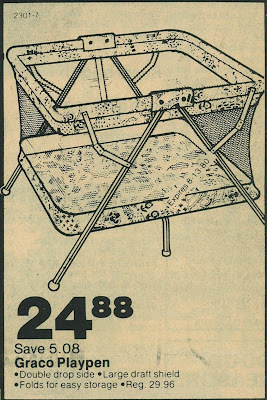 Remember - the Pack-n-Play hasn't been invented yet! 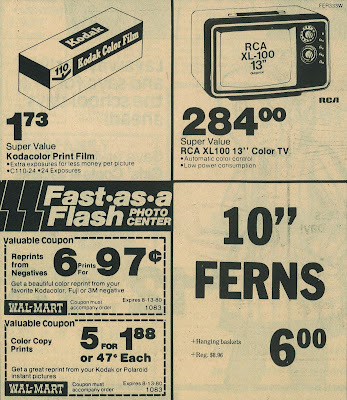 Say, Aaron, I think we had that RCA TV posted in the "sale circular." 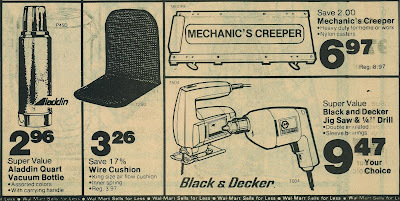 Actually we got ours around '79 when our giant color console TV went out, and my dad thought a 13" ought to be good enough to replace it. Eventually it ended up in my room, and I played many a game of Pacman on my Atari 2600 hooked up to it. I think my mom would sneak in my room while I was at school and play. She was a Pacman addict! I too bought many a 45 vinyl record at the Wal-Mart (pronouced Wal-Mark by my aunt) on Geyer Springs where we East Enders generally shopped.